The JBIFC is very sad to report the death of the acclaimed stage and screen actor Albert Finney, who has passed away aged 82. Finney, who rose to acting fame as one of the ‘New Wave’ of British actors of the late 1950s and early 1960s, received 5 Oscar nominations (although he never won), and collected numerous other awards for his work in film, TV and theatre. He refused a Knighthood, as he felt such honours were too ‘snobbish’. Born in Salford in 1936, Finney showed clear acting talent and was encouraged by a school-master to develop these skills further. He won a place at the prestigious Royal Academy of Dramatic Arts (RADA), where he found himself learning and finessing his art alongside the likes of such future stars as Alan Bates and Peter O’Toole. Finney’s breakthrough role came with the gritty movie Saturday Night and Sunday Morning (1960), a ‘kitchen sink’ type of drama that portrayed northern working-class social life in post-war Britain in a realistic way that had never really been seen before. The film made Finney an overnight star, and deservedly so. He went on to star in plenty of other films, taking parts as diverse as Hercule Poirot and Sir Winston Churchill, but he also became a regular and highly praised stage actor. He also turned his talents to directing, and became especially keen on raising finance to help other talented directors and rising stars, particularly projects that would not normally be attractive to mainstream film financiers, such as Lindsay Anderson’s daring movies If… (1968) and Oh Lucky Man! (1973). 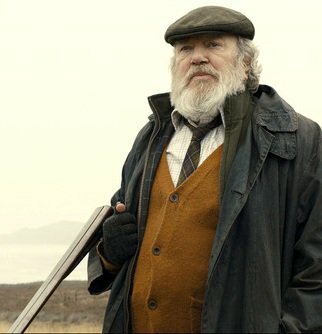 For James Bond fans, of course, Finney will be especially remembered for his excellent role as the gruff gamekeeper Kincade in Skyfall (2012), directed by Sam Mendes and starring (in his third Bond movie) 007 star Daniel Craig. Looking very much the part as a world-weary, deep-voiced and wise old gamekeeper, who had looked after the Bond family home in the highlands of Scotland since James Bond’s childhood, the role of Kincade was Finney’s final major film role. The scenes with Finney were shot at Pinewood Studios and also in Surrey, where Bond’s gothic-style ancestral home (‘Skyfall’) was built on Hankley Common near the quiet village of Elstead, on some Ministry of Defence land. The rough landscape doubled nicely for Scottish terrain. The setting became the climatic scene for a dramatic confrontation between Bond, ‘M’ and Kincade versus villain Raoul Silva and his band of henchmen. The James Bond producers Barbara Broccoli and Michael G. Wilson said: ‘We are heartbroken at the loss of Albert Finney. It was a privilege to work with him and an honour to have had him as part of our Bond family’. Similarly, two-times Bond director Sam Mendes commented: ‘It is desperately sad news that Albert Finney has gone. He really was one of the greats – a brilliant, big-hearted, life-loving delight of a man. He will be terribly missed’. He was a great actor with his career and life. He will be sadly missed.